The presence of water sports activities has played a vital role in making this gulf city a tourist attraction. 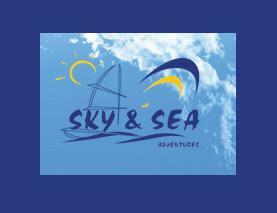 Like other sports activities providers Sky & Sea Adventures at Dubai Marina are also known for endowing the best service. The safe and secure activities of water sports are being held at Hilton Jumeirah and Sheraton Jumeirah Hotels. Families and friends pay visit here and enjoy some leisure time by getting away from the busy life. Several water based activities are organized under the supervision of Sky & Sea Adventures Dubai Marina, which are Snorkeling, Body Board, Wind Surfing, Water skating, Wake boarding, Sailing, Fishing trip, Boat Cruise, Parasailing, Banana Ride, Donut Ride and Kayaking. If you do not wish to get involved in any water based sport then enjoy the facility of restaurants and bars available at Hilton Jumeirah and Sheraton Jumeirah Hotels. Along with windsurfing, sailing, waterskiing ad wake boarding courses are held for those who admire water sports but they are not aware of the proper techniques. 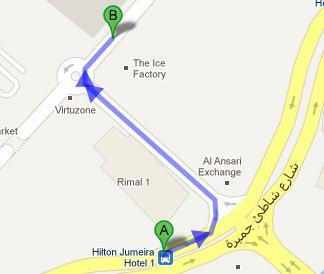 In order to reach at your destination by utilizing the bus service then make sure you take route number 8 from the Ibn Battuta Metro Station 1, so that you get dropped at the nearest bus stop the Hilton Jumeira Hotel 1, which is 350 meters away, by walk it will take 5 minutes to cover the extent space between two loations. From the stop commence in the east direction on the Jumeriah Beach Rd. Keep on moving until you cover around 57 meters and then take a slight left turn. After covering 230 meters distance take a right turn keep on walking; the last right turn will take you to your destination. For a detail view of the pedesterian route you can take a look at this Link.